You are at:Home»iPhone»A Gray Box Is Blocking Messages On My iPhone. The Fix! You can’t reply to text messages because a gray box with 0:00 is preventing you from entering text in the Messages app on your iPhone. A lot of people started having this problem immediately after Apple released iOS 9. In this article, we’ll walk through the simple fixes to get rid of the gray bar that’s preventing you from sending iMessages and texts on your iPhone. The gray box is supposed to appear when you send an audio message with the Messages app. Normally, you press and hold the microphone icon on the right side of the text box and the gray box appears as you record your voice. 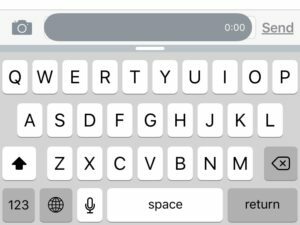 That’s where the 0:00 is coming from: A glitch in the Messages app is causing the gray box to appear in front of the text box, even though it’s supposed to stay hidden in the background when you’re not recording audio. The 0:00 refers to 0 minutes and 0 seconds of audio recording, and you should never see that unless you’re recording audio. There isn’t a magic bullet that fixes everyone’s iPhone, but if you follow these suggestions, I can guarantee with almost 100% certainty that we’ll solve the gray box problem for good. Feel free to check the Messages app after each step to see if the problem is resolved. If it isn’t, go on to the next step. Double-click the Home Button (the circular button below the display) and swipe the Messages app off the top of your screen to close it. Press and hold the power button until slide to power off appears. 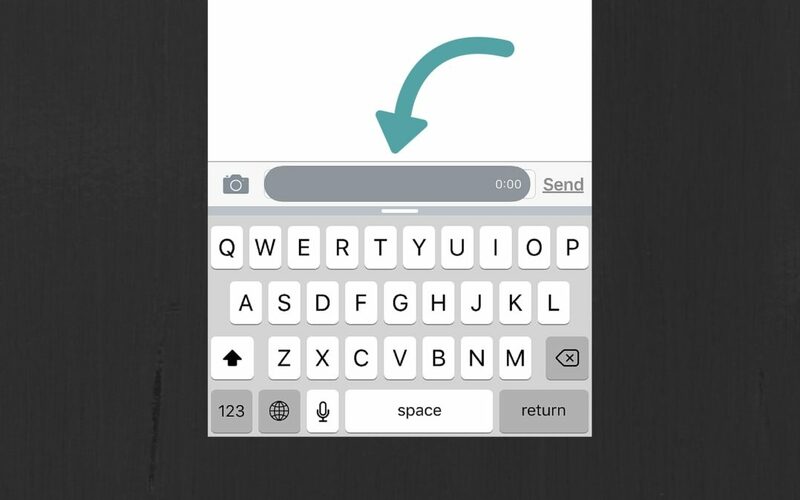 Swipe the icon from left to right and wait as your iPhone turns off – it will take several seconds. Turn your iPhone back on by holding the power button until the Apple logo appears on the display. Go to Settings -> Messages and turn on Show Subject Field and Character Count. 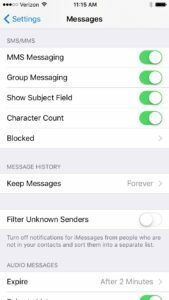 Close Settings and return to the Messages app. Chances are you’ve solved the problem – but you probably don’t want these settings left on indefinitely. Go back to Settings -> Messages and turn off Show Subject Field and Character Count. In many cases, simply turning these settings on and back off again gets rid of the gray box in Messages. Go to Settings -> Messages and tap the green switch to the right of iMessage to turn iMessage off. You can’t send audio messages when iMessage is off, so the gray box should disappear. If the gray box is still there, close the Messages app like I describe in Step 1, reopen it, and check again. iMessage is a great feature, and you probably shouldn’t leave it off. Head back to Settings -> Messages and turn iMessage back on. When you reopen the Messages app, the gray box should be gone. In this article, we fixed the gray box that was preventing you from sending text messages and iMessages on your iPhone. It’s a glitch with the Messages app in iOS 9, and Apple will undoubtedly fix it soon. Until then, I’d love to hear which step fixed the problem for you in the comments section below. Previous ArticleiCloud Storage Full? Never Pay For iCloud Backup Again. Next Article Does iPhone Voicemail Use Data? Visual Voicemail Explained.